If you haven’t already started baking your homemade Christmas cookies you need to do it now. At the very least you can get a head start on things with a little planning. List what homemade cookies you want to bake for the holidays. Divide the list into cookies you will give away, cookies for parties, Christmas cookies for school activities, etc. 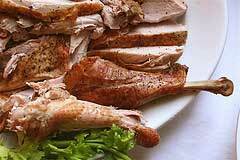 and also list the ones you will be serving for your own family closer to Christmas. 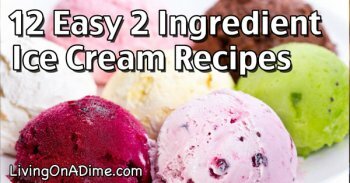 Make the list of ingredients you will need and then go buy them so you will have them on hand. Stock your pantry. Get as much as you can done ahead of time (now). Most cookie dough can be refrigerated or frozen so mix as many batches as you can. Some great doughs for this are basic chocolate chip or sugar cookie dough. You can take these two and add almost anything to them: chips, dried fruit, candy etc. Freeze the dough in small batches. If you only want to bake one or two cookie sheets at a time you don’t have to thaw the whole batch. I do this all year around. I keep small rolls of dough in my freezer. When I hear the grandkids are on their way, I pull out the dough and have a hot pan of cookies when they get here. It makes the house smell good for them, too. If you will be using colored sugar or coconut, mix it up now. To make either one, place the sugar or coconut into jars with a couple of drops of food coloring and shake. Store it in there until ready to use. If you love shortbread and like to give it as gifts, do it now and store in an airtight container. Shortbread cookies are one of those cookies which are better if they are aged for at least a couple of weeks. If nothing else, at least measure out your dry ingredients. Place them in plastic bags so they’re ready to use. Be sure to use what the recipe calls for, whether it is butter, shortening or margarine and never use margarine that is whipped, soft spread or reduced fat. Your cookies will spread everywhere if you do. It is best to bake only one sheet of cookies at a time but if you must do more, leave a couple of inches around the sheets for air circulation. Let the baking sheet cool between batches because placing dough on a hot sheet can make the cookies spread too much. If your recipe calls for oatmeal or nuts, toast them before using them. Fill a container that has large holes (like a sugar shaker) with flour to sprinkle your board before rolling out cookies. Make sure when you roll out cookies to cut that they are all the same thickness. Each individual cookie must not have thin or thick spots either or they will bake unevenly. You can buy rubber bands to put on your rolling pin to get an exact thickness, but they are expensive. I have always used 2 strips of cardboard (the thickness that I need) covered in foil and just lay them on each side of the dough with each edge of the rolling pin laying on a strip. 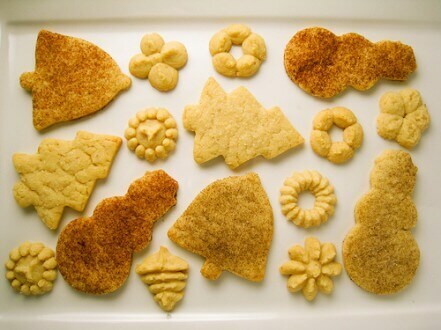 If you don’t have cookie cutters or enough time to use them, just roll out your cookies and cut in squares or diamond shapes with a pastry cutter or pizza cutter. Sprinkle with colored sugar and bake. Use a wire cheese cutter to slice chilled refrigerator cookie dough. If you are making huge batches of homemade cookies and do a lot of baking, you might try using old oven racks to cool them on. Just place something under each corner to make sure it is raised up slightly off of the table. Cookies keep very well for a very long time without freezing. Most cookies don’t have ingredients the health department calls “toxic” (their words not mine) and are very safe to keep for long periods. Always completely cool cookies before storing and never store crisp cookies and soft cookies together. Store soft cookies in an airtight container and crisp cookies in a container with a loose lid. I find that tins work best for storing homemade cookies because sometimes the cookies pick up the flavor of plasticware if it was previously used to store something like spaghetti with garlic. This is especially true if the cookies have a lot of butter. If you have cookies that have ingredients like cream cheese, they will need to be stored in the fridge, but the recipe will usually tell you if you need to do this. You can freeze cookies up to 3 months. When shipping cookies, be sure to give them plenty of time to get there and always mark “perishable” on the package. Soft moist cookies, cookie bars and drop cookies ship the best. Metal tins are really the best shipping container for cookies, but if you don’t have one then a sturdy cardboard box will work. Line the box with plastic wrap or foil then place the cookies in it. Crumble up wax paper to place on top sides or anywhere you need cushioning. I then slip the whole thing into 1 or 2 plastic bags. I wrap that box in bubble wrap and place inside another box. You could also use newspaper, peanuts or even popcorn for cushioning at this point. Cookie ingredients can be very expensive, especially for homemade Christmas cookies. If you need to save money, choose your family’s favorites that have the least expensive ingredients. For example, my family loves sugar cookies about the same as chocolate chip cookies. The sugar cookies cost much less because they don’t have things like chocolate chips and nuts in them, so I would bake the sugar cookies. Another way to save on ingredients is to use less of things like nuts and baking chips. You really can get by with putting half a bag of chips instead of a whole one into chocolate chip cookies. The same goes for nuts. If that same recipe calls for 1 cup of nuts, use just 1/2 cup. When giving cookies as a gift, make them look more attractive by putting them in cellophane bags and tying with a ribbon. Instead of just slapping cookies on a platter for your Christmas dinner or party, add a couple of votives or one large candle in the center of the platter for a more festive look. Save those dried out cookies or that handful of leftover homemade Christmas cookies. Freeze them and use them in place of any recipe or dessert that calls for a graham cracker crust. 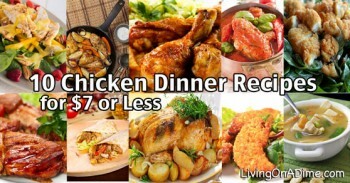 For lots of great recipes and tips for homemade cookies and other scratch cooking, take a look at our Dining On A Dime Cookbook here! You’ll find almost 500 pages of very helpful information to help you learn to work all kinds of magic in the kitchen! Next Post: How Much Is Clutter Costing You? I found a great cookie recipe for when you’re in a hurry. I sometimes will either make my own sugar cookie dough, or when on sale, grab a roll of the prepared stuff in the grocery store. You let the dough soften, add just a little more flour, add in choc chips, nuts, (I used “craisins” dried cranbury-raisins), chopped macadamia,walnut,or pecan, whatever you have, )and make it like a drop cookie. They froze very well, and the craisins gave a beautiful red Christimasy color, and a burst of flavor. I think I found this in a magazine, but If it was really Dining on a Dime, I truly apologize for the repeat. Since I’m always traveling between New Jersey and Massachusetts, having things prepared and frozen is the only way I survive. A beautiful day to you all! Another tip is to doublepan your cookies when you bake them. It keeps the bottoms from over cooking before the tops have finished. I have done this for years, and love the results. I have those silicone sheets for baking cookies on. they were on sale for a dollar a few years ago so I was going to get one. My husband saw the one asked what they were and then how much. He tossed 10 of them into the cart. I have given them as gifts but still have enough that I can have a tray ready to go into the oven just by taking one sheet full off and putting the unbaked ones onto the same pan without waiting for them to cool. I make up batter then roll it into logs about 6 inches long. as we want cookies I take out different types and bake up a dozen or 6 with little hassle or mess. Melt some chocolate or white almond bark in a dbl boiler. Dip store-bought oatmeal, sugar or peanut butter cookies into the melted bark halfway. Add some appropriate holiday sprinkles (optional) and let dry on waxpaper. These are “dressed up” commercially baked cookies so they travel well and are convenient. I often buy these cookies on sale and freeze them until the holidays. Use dark almond bark for peanut butter cookies and white almond bark for oatmeal/sugar cookies. When using oatmeal cookies add a dash of maple extract if you have it which gives it a more mellow flavor. Good idea Janice. My thinking is anything dipped in chocolate instantly turns it into manna from heaven. This isn’t a cookie tip but what you wrote reminded me you can dip pretzel rods and roll them in sprinkles or crushed leftover Halloween candy. Candy canes are inexpensive too and you can kick them up a notch by dipping them in white or regular chocolate. Tie a bow on a bundle of them and great simple gift. Thanks for the tip Lorie! I just tried it on a batch of cookies and it worked like a charm. I almost never make sugar cookies because I can never get them to bake right but this worked great…. Another quick cookie that is a “no bake” is to melt the chocolate almond bark and thin with some solid shortning. Using the ritz type crackers – spread with peanut butter to make cracker sandwiches then dip these into the almond bark and place on wax paper placed on baking sheet. 5 minutes in the freezer, they are ready to eat. My young visitors love this and say they taste like a TWIX bar. I keep extras in a small plastic container in the frig. 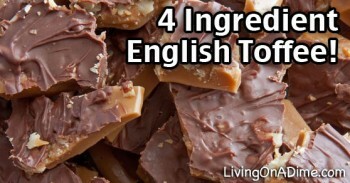 You can make just a few or a bunch – I use this as my dessert for church events – none left! Jill, I was looking through some holiday books over the weekend, and came across some gingerbread cookie recipes and ideas, and thought of you. Did you know that gingerbread cookies are traditionally served in northern Europe and there is a legend there that the more gingerbread cookies you eat, the nicer and friendlier you will become? Children there eat many during the whole month of December. Now I don’t know how many you personally eat, but I think the legend applies to a person who makes a lot of them too. Maybe that explains in part why you are so nice. What are lovely story!..For X’mas I bake Greek almond shortbread..’kourabiedes’ …recipe makes heaps , it’s cheap and ever so ‘moreish’. billime .. i do the same thing and janice same thing with the cookies .. pretzels .. etc .. i have even taken those walmart brand choc covered graham crackers… drizzled with white chocolate .. add a few colored sugar and voila! .. hehee 😀 ..
my kids like this one the best: take a bag of the chinese noodles (can be found in walmart in the section where they sell some oriental food).. melt a bag of butterscotch chips .. put the crunchy noodles in the melted chips til all is covered .. spoon out a dibble at a time (they look like crunchy cookies) .. set on wax paper to dry .. and voila .. easy homemade butterscotch crunchies .. 😀 ..
Rose, we call these “No Name Cookies” in my family. My recipe calls for peanut butter, butterscotch chips and chinese noodles. They are so easy to make even my son who can hardly boil water can make them!! Don’t ask me why I didn’t teach him how to cook but I did teach his sister!!!!!!! Rose, You can use Ramen Noodles for that recipe too. I made cookies like that with peanut butter and melted chocolate. saw this recipe in the paper and thought it sounded good and easy. I like that it says not too sweet so will be making it, for christmas. I know she says Halloween but cookies are for whenever. I came up with this recipe about 5 years ago and I have been making them every Halloween since. They don’t last very long though. Especially if you have little monsters tall enough the help themselves from the plate. I call these cookies, but they are more like a half cookie, half scone. They are fluffy and not too sweet, but there is a lovely vanilla cinnamon glaze that gives them just a touch of sweetness, if that is what you desire. Cream the butter and sugar in a mixing bowl- Add the egg and continue to mix. In a small bowl mix together the flour, salt, nutmeg and baking soda- gradually add to the butter mixture. Once all of your flour is incorporated, stir in the oats, and then the pumpkin. Drop spoonfuls of the dough onto a cookie sheet, flattening the mound a bit. While your cookies are cooling, you can mix up the glaze. It isn’t necessary to glaze them, but it is pretty darn good! Mix the first three ingredients together. Add milk, teaspoon by teaspoon until all of the sugar is dissolved, and the mixture is smooth. Drizzle over the cooled cookies and let the glaze set, an hour or 2. Then it is time to enjoy! Have one (or 4) with a cup of warm cider, or tea. Don’t forget to bring a plate across the street to the neighbors! This recipe sounds good. What I really like too is the idea of putting a little cinnamon in the glaze or frosting. I bet putting a little cinnamon in any frosting you use on pumpkins cupcakes, cookies etc. would be extra good. that recipe looks so good grandma .. thanks for sharing .. i love anything that has pumpkin in it .. 😀 .. When I get ready to roll out my cookies I use some 1/4″ thick wood molding that I had my husband cut 18″ long. I wrap it in tin foil and put my rolling pin on it that way all my cookies are the same thickness. When you are finished you can wipe the tin foil clean or replace it next time you use them. I keep them in my draw next to my rolling pin so I don’t forget them. You can do the same with 1/2″ molding for making biscuits. What a good idea Minda to use the molding. For you new cooks and even some older ones it is important to make sure the cookies you roll out are the same thickness because if some are thinner then others or thinner in some spots they won’t cook evenly and like in the case of my gingerbread men I can have a burnt arm or leg or half the cookies on the pan can be cooked and starting to burn and the other have aren’t finished cooking. This is not on this topic but You sent out some tips on simple Christmas gifts about a week ago or so. Is there any way I can get another copy of that letter? Thanks. Do you know anything about it? We have a couple of articles like that. I love all of these tips, Jill. I am going to print them and keep them with my cookie folder on my computer. I love Janice’s tip about using store-bought cookies and dipping them in chocolate. What a great idea when you are in a bind timewise! I do that with pretzels and a few other things, but this is a real tip. I also find that when I don’t feel like making cookies, I just make them into bars to be cut after they cool. That is a great timesaver for me. We are having a cookie swap at church soon and I am definitely making cookie bars. I forgot to add that I use parchment paper when I make cookies. Someone else may have posted the same thing, but I haven’t read every post yet. The parchment paper keeps things from sticking to the pan and you don’t have to use spray or anything to grease the pan if called for. The only thing is that you must not use parchment paper in anything higher than 400 degrees. You can re-use the paper when you remove baked cookies and are ready to put more cookies into the oven. Doris I love parchment paper too and have really gotten spoiled using it. It is surprising because I use the same piece over and over and over many times. Considering I make a lot of cookies I don’t even use one roll a year so that tells you how long it lasts because many of the cookies I just brush off the crumbs and save it to use next time. you make a batch cutting them into squares and have her make a batch using her cutters. you will be done so much sooner I am sure while you make her a cool drink of lemonaide or iced tea she will have all the convincing necessary. To Gary: Glad you like this idea. 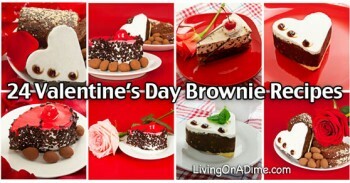 I found some great cookie bar recipes, which I am sure can be found on lots of the cooking sites. Good luck with convincing Mom!!! sorry bea .. i just read ur ?? … i am not sure bc i have never tried using the ramen noodles .. i know the crunchies i do use look like thin little sticks .. and they are very good .. the kids love them at xmas time .. The main body is exactly the same but we did add our Pretty for Pennies to it which had all the lip balms, bath salts, lotions and other homemade toiletries. We also added a big cleaning,organizing and laundry section which not only has cleaning how tos but also recipes for homemade cleaning products (and laundry soap, dishwasher soap, all purpose cleaner just to name a few). So there is a bit more to it now. How are your gingerbread men coming along this year? When you decided to start selling them, did you advertise in a newspaper? Or, how did you get the word out? I’m so happy that this has been a way for you to make a little extra money. Soemtimes I think who are short on money get discouraged too easily and don’t realize they DO have talents that can make them extra dollars. God gave us all special gifts! I have never advertised it has just been by word of mouth. The thing is I give out almost as many as I sell and when people taste them they ask if I will make some for them. Oddly over the years for most of my businesses I have not done any at all or paid for real advertising. Part of the secret is listening to what people need or like and then filling it.The other part is having a really good product with good customer service. Last but not least it takes time and perseverance in most cases. My first year I sold 3 dozen and made $6. That gave me just enough to buy a few treats and dinner for our Christmas day. The next year I tripled that and made $40 so I had enough for dinner and most of our presents. Yes most people do have something they can do to add their income. It’s especially good to think out of the box. Love all of the tips about the cookies. I always pick up a good tip o two. I have used popcorn to cushin cookies when shipping and I have also used minature marshmalos. I have a lot of great cook books but NONE as useful as Dining On A Dime. I complimented my 16 yr old grandaughter on her pies for Thanksgiving. She laughed and said she got 3 of the 4 recipes from her Dining On A Dime book I got her. LOVE THAT BOOK!!! Thank you Malvina. I told Tawra when we first wrote it I wanted ours to be a book people could actually use and by that I meant everyone and anyone and with normal food ingredients so I do love it when I hear people are not only using it but their children, grandchildren and husbands. I got the biggest kick because I called HSN (the home shopping network) the other day and the gal on the phone asked me for my e mail address. I gave it to her and she said “That’s funny. I use to live in Wichita and my mom gave my sisters and I this cookbook we just love and my husband and I cook out of it all the time. It was called Dining on a Dime.” Boy it is a small world any more. Jill, how do you determine the prices you charge for the services you offer, like ironing or cokkies? Usually what I do is do a trial run and see how long it takes me to do something then I figure how much I would like to get an hour to make it worth my while. Next I compare it to what others are charging and then go from there. For example I called the cleaners and they charge $1.50 to iron a shirt. I can iron 8 shirts in an hour so I will charge $1 per shirt which equals $8 an hour. I like to under price slightly what places like cleaners to encourage customers to come to me. Now that may not seem like you earn much but the secret is I charge $2 for pants which is much less then cleaners but it takes me the same time (sometimes less) to iron those then shirts so if some one brings me 5 pants and 3 shirts I then would make $13 an hour. I set my prices for a basic man’s shirt and then tell them if a woman’s shirt has things like a ton of ruffles or pleats I will charge $.25 -.50 extra. Dresses $4-5 dollars and full skirts are $1 extra. Now these prices can change and you need to adapt them for your area. My cookies I add up how much the ingredients cost for 10 doz. cookies, for example lets say it takes $3 worth of ingredients and then the time it takes to bake 10 doz.1 hour from start to finish. If I charge $5 a dozen that is $50 for 10 doz. minus $3 ingredients I clear $47. These again aren’t exact numbers but gives you and idea. Don’t forget to factor in things like I sometimes deliver large orders. One thing is with something like the cookies get a good recipe that doesn’t call for expensive ingredients but tastes delicious and like with the ironing I had one lady bring me nothing but very complicated shirts (with ruffles etc.) and no pants so I had to quit doing her ironing because I wasn’t making enough. I wonder, has anyone tried making a sugar cookie “puzzle”? I have a nephew who LOVES puzzles, and I wanted to make him an edible puzzle as part of his Christmas gift. I am just trying to figure out how to glaze them after baking. I figured I could just cut them out of a sheet of cookie dough with a pizza cutter. I know the holidays have passed but here are 2 of my cookie tricks. My “secret ingredient” in all my cookies that call for walnuts (& some pecan recipes). Black Walnut Extract. I put about 1/4 of the nuts called for in recipes and replace the vanilla with the Black Walnut. The aroma in the house and in the cookie is incredible, and they are very addicting. I think it is because they pack a lot of flavor into a little cookie. Also, if you don’t have a cheese cutter to slice your dough, or need a thicker slice use dental floss. Place the floss under the log, bring both ends up, grab the right floss end with left hand and left floss with right and then pull. You can adjust the thickness easily. I slice cinnamon rolls this way too. The rolls stay nice & round. When making chocolate covered pretzels– by the mini pretzels, arrange them in a circle on wax paper & them drizzle chocolate over top. Be sure there is a good amount of chocolate to link the pretzels. I then drizzle with white chocolate if I have it, add “splash” it with colored sugar or crushed peppermints. They make adorable edible wreaths as gifts. And dress up a buffet table too! There is such a thing as pecan extract. You may have to go on line to get it or try cake decorating stores where they sell all the supplies like cookie cutters, decorating tips and bags etc. I use well seasoned cast iron griddles for my cookie sheets… they work great. Refrigerator cookies made one day, rolled up and wrapped and then baked another day are a lifesaver. This year I used the granola bar recipe from this website as a Christmas cookie. I just cut them into bars, wrapped individually, packaged in some nice gift boxes and stored in the freezer until I am ready to give them away. That recipe was a real winner here. Thanks for all the tips, advice and encouragement from everyone on this website. this is a cookie dough you can do so many different cookies with. My tip is to cream butter and sugar longer than you think, than add one egg at a time, add flour one cup at a time. I add 1 teaspoon of almond flavoring. I use my cookie gun to make these cookies. I add food coloring to the dough and then shoot them out, bake at 350 for 11 min. take out and place on COOLING RACK, then transfer cookies to a different rack. I love all the tips and the comments. Thanks for your time . I enjoyed your helpful article. Here are some questions: I thought that I had read an article a long time ago, that one should bake cookies and other food items right away. The reasoning was that when the baking soda and/or baking powder became wet that it started to raise. If I remembered what I read wrongly or if that is not true, please let me know. When you thaw frozen cookie dough can you just set it on the counter to thaw or do you put it in the refrigerator to thaw. I am guessing that putting it in the microwave and pushing the button to Thaw would not work. You are partially right Janice. When baking some things like biscuits, pancakes, cakes, waffles in some cases and recipes it can make a difference in how the baking powder reacts and starts working but for cookies it is different. Many times cookie recipes say to even chill the dough for a certain amount of time before baking or to mix the day before. I have also found it to be true too that often like with my gingerbread men dough the cookies actually taste way better if it has been mixed ahead of time and frozen. I don’t know all the scientific ins and outs but it has something to do with the ingredients having time to inter act with each other which makes the cookies better. As far as thawing goes you can do it on the counter or in the fridge. I do it both ways depending on how big of a hurry and what kind of cookie I am working with, for example the dough I roll out and cut I usually (but not always) try to thaw it in the fridge just because I need it to be slightly chill to roll it out where if left on the counter it can get to soft for me to roll. Chocolate chip cookies and the like I don’t worry about them being chill although I am usually in such a hurry to bake them that I often slice them while they are frozen, slap them on the pan and bake. Sometimes you may have to adjust the temperatures and time but I don’t usually worry about that to much especially if I am fixing them just for my kids. You are right – don’t thaw in the microwave. It will cook it ever so slightly and in general I don’t have good luck with any thing like that in the microwave. I really enjoy your emails and have three comments. First, to ship cookies, empty pringles cans are wonderful. Just make your cookies the size that will fit. Second, popped popcorn is a wonderful packing medium because when it arrives at its destination, it can be fed to the birds. And third, to standardize the thickness of sugar cookies, I took 2 strips of 1/4″ paneling (my husband likes thick cookies), covered it with contact paper and lay that on either side of the dough. It washes well and I’ve used mine for years. Great ideas Charla. After I wrote this article I went to the hardware store and they had some scraps of 1/4 plexi glass that they were just going to toss so they let me have them to use for rolling out the right thickness. I used those for a long time. Jill – thank-you so very, very much for your informative reply. I have had those questions about frozen cookie dough for years. Thanks for these lovely Christmas recipes! Cooking lots of “cookies” isn’t a tradition round here. ( As a retired teacher, trying to watch her weight, I’m glad of that) . I hope you all enjoy them. Happy Christmas, ladies, or the Festival You Love.